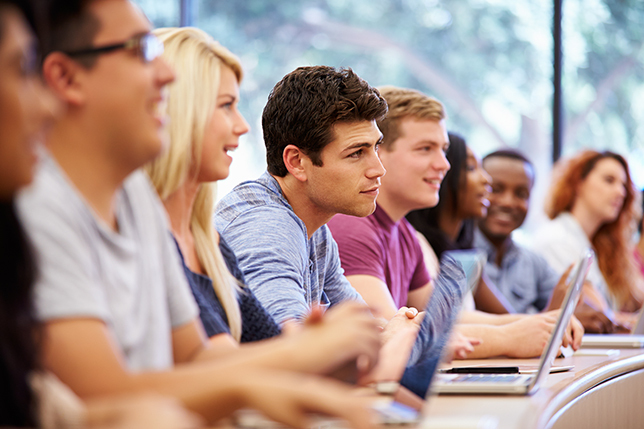 What does student success mean in a digital ecosystem? The most prevalent measures involve retention and graduation rates — students pass their classes, move through the curriculum and ideally graduate in four years — but those "institutional outputs" are the lowest-common-denominator definition, according to Gardner Campbell, vice provost for learning innovation and student success, dean of University College and associate professor of English at Virginia Commonwealth University. Campbell took part in a recent Future Trends Forum video chat hosted by consultant and futurist Bryan Alexander to share his thoughts about how higher education might rethink ideas of student success in a digital age. While graduation rates are the type of success that registers on university dashboards, their influence is pernicious, said Campbell. "Whenever you are in a system in which institutional outputs and the single individual private goods (the degree you earn) become fatally interwoven, you get into a very strange situation in which success of the individual is defined in terms of institutional outputs," he explained. And when the need for institutional outputs drives the definition of what success is for students, the measures of success can become corrupted, Campbell noted. There are many ways to assure people are successful in their coursework, he added, including grade inflation. "It leads to teachers who are deathly afraid of giving anything lower than a 'B' or 'C' because that gums up the student success works." "In a digital ecosystem, we are talking about shared private goods that contribute to a public good," Campbell continued. "That is what we need to emphasize if we mean to have meaningful civic engagement in this medium in the years to come. If we don't, we are not going to be in good shape as a polis, as a democracy. We won't have what I think of as truly lasting student success, which is effective participation in this digital commons or in the largest commons of all, civilization." Campbell described his conception of learning in a digital commons as open, participatory and connected learning. "It is different from just all the apps on my smartphone," he said. "It is something we all have a stake in and should all recognize we have a stake in. We should all be contributors to that digital commons as well as consumers of what is open now and what may increasingly be behind paywalls in the future," he said. "It is a digital commons we are all nourished by and must contribute to." When asked if higher education is subsuming the needs of the students to the good of the institutions, Campbell responded with an analogy. Americans used to believe that if it is good for General Motors, it is good for the country, he said. Similarly, we might think that if the retention and graduation markers in the particular institution are high, that must therefore mean we are doing something right as far as the students' own good. "And I hasten to add that that may be true," he pointed out. "No doubt, often it is true. But I do think institutions, and not just in higher education, tend to define their success as an institution in terms of the fact that they have been sustained as an institution." He described a chain of mutual dependencies around this idea of success: "The problem in higher education becomes that, like the U.S. Mint, we make our own currency. We're the ones who assign these grades; we are the ones who define what success means; and we are the ones who can double down on various measures of success that may have very little to do with deep learning, the transfer across domains, and nothing at all to do with the digital ecosystem, which by and large higher education has turned its back on." The digital ecosystem is rejected by much of higher education in part because we can't just mint our own money in that medium, he said. "In an open, connected, participatory culture, we have a whole host of voices out there who may not give a tinker's cuss for the comma splice because it was an interesting blog post. And they may not be at all interested in a very well polished five-paragraph essay posted as if it is a blog post that would nevertheless get a good-student certification from a writing teacher." Campbell talked about many of the challenges higher education has faced in its attempts to scale up over the last century. "We have had to scale up massively over the last century and we have no good way within higher education as a closed community to scale up," he said. "The expert guiding the learner becomes more detached from that essential relationship; more of the assessment becomes transactional and we begin to speak of dashboards. Also, external audiences begin to intrude, probably because we have started to lose some trust." For example, boards of regents want to see evidence of results. "Inevitably we try to find indicators that can be understood very quickly by a group of concerned yet busy people who need to know within 45 minutes four times a year how we are doing. That inevitably leads to certain oversimplifications, sometimes engaged in with the best of intentions. But you begin to debase the currency because the complexity goes down." It used to be that a certain kind of personal formation was considered part of the duty of higher education, Campbell noted. By abandoning that idea of personal formation in favor of a polytechnical approach — focused on specific kinds of workforce preparation skills or competencies — we end up with something quantified in ways that will lead to a devaluing of the experience, he said. "And when that has happened, it is not clear to me we can sustain any of the things that most of us who work in higher education continue to treasure," he stressed. "We are in some respects a little sequestered, a little abstracted from the daily press of business. We are afforded an opportunity to consider who we are and what type of world we would like to build. There is no other sector in society that affords that opportunity. And I fear that higher education just can't find a way to articulate or justify that kind of public good anymore, a public good that arises out of personal experience. I fear where that will take us." But Campbell pointed to the web as an exhilarating, thrilling and successful counterexample of scaling that brings greater personal involvement and engagement. For some reason, though, the scaling strategies of the internet — innovations from the edges, decentralization, common protocols, a certain kind of personally motivated activity that can nevertheless be shaped for good or ill by various kinds of community — seems to have been of little interest to higher education, he noted. "Instead we have sold our birthright for a mess of pottage." "One of the things that really does keeps me up at night is the tragic irony that we cannot see our own highest principles in the digital world at its best," Campbell said. "We helped be the model for that world. I am aware that there are many problems with the web — security, for instance. I am aware that there are nasty places in Reddit. However, without our strong and self-recognizing presence in those areas, we do our students a grave disservice, and we turn our backs on a model of scaling we could adopt, adapt and be creative within in a way that would benefit our learners. I think there are certain aspects of privilege that have gotten in the way of recognizing our own strengths, and it makes me very sad." Alexander asked what personal formation might mean as a success measure if we imagine an academia deeply involved with the internet. Campbell said he doesn't like to think in terms of learning outcomes because he sees most of the language as reductive, which drives reductive assessments. But the types of outcomes he is looking for involve personal interest, curiosity, awe and confusion. "One of the outcomes I would seek is an increase in the capacity for interest, both in breadth and depth. There are certain dispositional markers we can see, and there are profound opportunities for learners to demonstrate that increase." Campbell said he is not talking about an e-portfolio, per se, but a realization of e-portfolio practices. "I say practices instead of e-portfolio because as soon as I say e-portfolio, people will say, 'Are you using Digication or this product or that product?' The key to the kind of personal formation I am talking about is dispositional. We have a lot of talk about knowledge and skills, but there is a certain disposition toward the world we can encourage and that would be fairly non-controversial." Asked what should go into a learning portfolio, Campbell said that among other things, it is vital that there be some indication of unscripted connections across the work included in that e-portfolio. Many students may not be disposed to reflection, but giving specific instructions about reflection is going to produce compliance, not true reflection. "I want room for things that are not simply complying," he said. "I think it is important to encourage students to make connections — by that I mean hyperlinks on the web across the courses they are taking. The interaction is not defined as just the student interacting with the teacher, but the students as a community of learners indicating their interest and the relevance of what they are learning."